This project aims to create a primary school in tropical savannah region that provides an education facility enriched with various play activities for students from 7 to 12 ages. 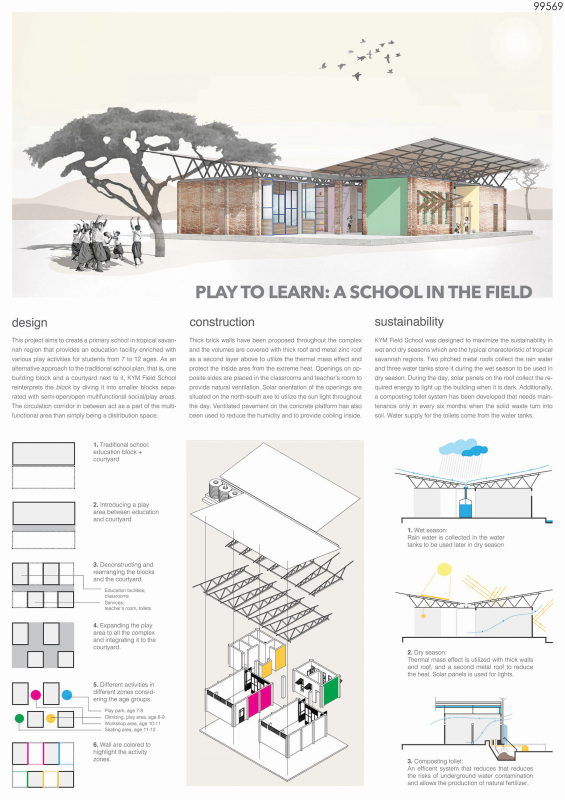 As an alternative approach to the traditional school plan, that is, one building block and a courtyard next to it, KYM Field School reinterprets the block by diving it into smaller blocks separated with semi-open/open multifunctional social/play areas. The circulation corridor in between act as a part of the multifunctional area than simply being a distribution space. 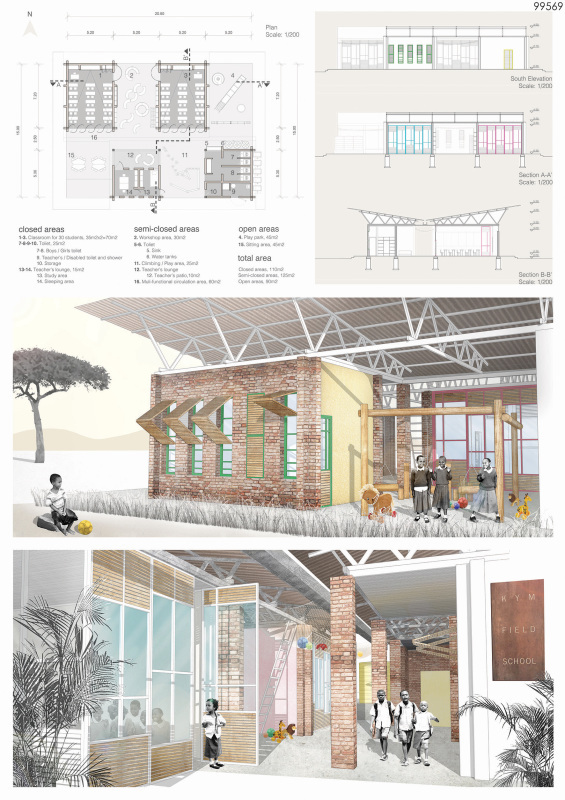 Thick brick walls have been proposed throughout the complex and the volumes are covered with thick roof and metal zinc roof as a second layer above to utilize the thermal mass effect and protect the inside ares from the extreme heat. Openings on opposite sides are placed in the classrooms and teacher’s room to provide natural ventilation. Solar orientation of the openings are situated on the north-south axe to utilize the sun light throughout the day. Ventilated pavement on the concrete platform has also been used to reduce the humidity and to provide cooling inside. KYM Field School was designed to maximize the sustainability in wet and dry seasons which are the typical characteristic of tropical savannah regions. Two pitched metal roofs collect the rain water and three water tanks store it during the wet season to be used in dry season. During the day, solar panels on the roof collect the required energy to light up the building when it is dark. Additionally, a composting toilet system has been developed that needs maintenance only in every six months when the solid waste turn into soil. Water supply for the toilets come from the water tanks.